Ahoy and apologies for the lateness of this post! The end of Daylight Savings has wreaked havoc (!!!) with the kids and the last couple of days have been...interesting. Sleep deprivation aside, this recipe is, strictly speaking, a salad that's a perfect complement to homemade chicken nuggets or pan-fried fish, but Sparky and I regularly have it with just some crusty sourdough for a healthy, quick dinner. Particularly good for a weekend. 1. Pop the corn into a saucepan, just cover with water and pop it on the stove. Once boiling, let it cook for around 8 minutes, or til tender. 2. Chop up your avocado and tomatoes and add to a bowl. 3. 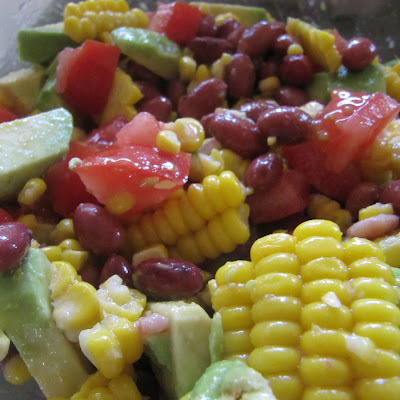 Drain and rinse kidney beans and pop into bowl. 4. Once the corn is cooked and cool enough to handle, slice off the corn and add to the bowl. 5. Add a squirt of lemon juice and a drizzle of olive oil, plus some salt and pepper. Give it a mix and then add a good handful of coriander (or maybe do this after serving, if your kids are eating it too and are not keen on the flavour of coriander). 6. Eat it as is or add to some crunchy sourdough toast. Deceptively tasty for such a simple meal. And also really super satisfying. It may be 7:43am right now, but I'd totally eat a huge bowl of this.